American Train & Track’s (AT&T) second Electro-Motive Division (EMD) F-unit was better than its FT, but not by much. Also a product of Mehano in Yugoslavia was this F9A diesel locomotive model. The 1968 release was the first F9A offered in plastic for HO scale and AT&T offered six road names, including one that wasn’t quite official at the time: Burlington Northern. The green BN F9 model includes decoration somewhat similar to what Chicago, Burlington & Quincy was applying to its new SD45 and U23C diesels, as well as other equipment prior to the March 1970 arrival of Burlington Northern. AT&T offered its powered F9A for $10.98. The only listed dummy was decorated for Santa Fe. 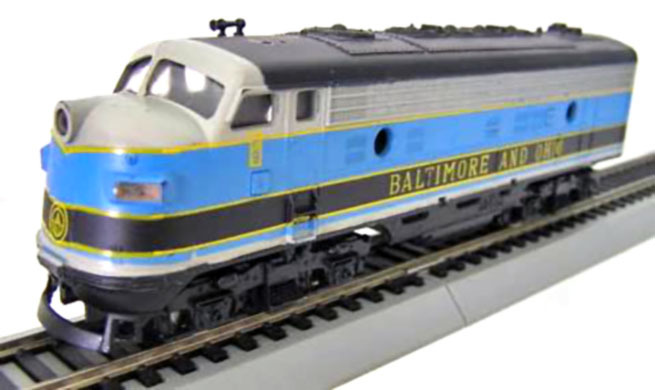 This second F-unit to appear in American Train & Track’s line went on to have a number of return engagements in the model railroading marketplace in North America. In the early 1970s, this F9A served in Life-Like’s catalog briefly. Following its service for Life-Like, you’ll find Model Power releases for this offering. In the early 1990s, this F9A made its most recent appearance as a stand-in for TYCO’s Shark Nose diesel in train sets during the final years that well-known name produced electric trains.